Heather’s duties include patient education, assessing patient side effects and progress, coordinating treatment and testing for certain thyroid cancers, assisting with HDR treatments, and assisting patient with a variety of medical needs. She enjoys getting to know her patients during their daily treatments. Heather feels inspired by the determination and strength of her patients and feels it is an honor to be a part of this delicate time in their lives. Outside of work Heather enjoys spending time with her family, attending the kids’ sporting events, helping with church activities, and serves on the Board of Directors Harvest House, a local homeless shelter. Gretchen has been with MCA since 1992. Her duties include but are not limited to, assisting physicians with procedures and navigating patient flow. “Our patient’s ability to smile through it on good days and fight through it on bad ones are attributes I admire most. They are warriors and I am honored to part of their journey. Their overall comfort is my priority.” In Gretchen’s free time she enjoys spending time with her son, two granddaughters and two grandsons, attending concert, going with her husband and dabbling in DIY crafts. Tricia has worked at MCA for 15 years. She attended Avila College where she studied Radiation Therapy and completed her clinical training at St. Luke’s Hospital in Kansas City. She and her husband have 2 daughters in college. 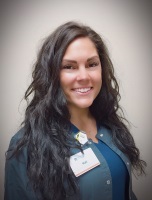 She enjoys caring for her patients’ everyday as-well-as being a part of their support network. Kara has been a Radiation Therapist at Missouri Cancer Associates since November 2016. She graduated from Saint Louis University with a Bachelor of Science (B.S.) in Radiation Therapy. “I love coming to my job everyday where I am able to help, care and comfort patients and provide guidance during a difficult time. I am proud to be a part of the MCA team where patients are provided the best care. In her free time, she loves being active outdoors, cooking new recipes and spending time with her family and friends. Paula started in radiation therapy in 1976 at Boone Hospital Center. She joined the MCA team in 2006. The best part of my job is interacting with all the patients. Paula’s spare time, she enjoys being with her family and training her Border Collies. Katelyn has been a Radiation Therapist with Missouri Cancer Associates since July of 2015. “I love my job at MCA because I get to meet wonderful patient and get to provide compassionate care to them and get to know their stories. This field is always growing with new technology and that is something that interest me.” In her spare time, she enjoys physical fitness, the outdoors, crafts, and spending time with her family. 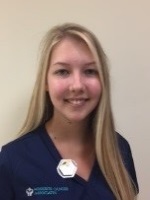 Kali is a Washburn University Student completing her clinical rotation here at Missouri Cancer. I am going to school to better my knowledge on treating cancer patients. 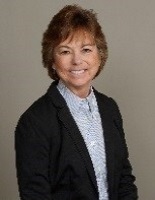 Iris has been a certified Medical Physicist by American Board of Radiology for over 20 years. She has worked at esteemed academic institutions, such as Loyola University as staff physicist, Henry Ford Health system as lead physicist, as-well-as several celebrated community hospitals. Her broad experiences and enthusiastic nature as it relates to patient-care has long been recognized. She was voted in as the President of Great Lake Regional Medical Physics Society in 2005. Along with her current Chief Medical Physicist duties, she currently serves as Co-chair of US Oncology Networks Radiation Therapy Policies and Procedures. Mark is a Medical Radiation Physicist who has worked at Missouri Cancer Associates since 2011. His duties include the routine testing of radiation-delivery equipment, assisting physicians with the planning and delivery of special high dose rate (HDR) radiation treatments, and generally helping to ensure that all radiation treatments are delivered safely and accurately. In his spare time, he enjoys playing guitar, exercising, reading, and keeping his cat out of trouble. Susan joined MCA in July of 2018. She received her Bachelor of Science in Radiologic Sciences from Avila University, and a diploma in Radiation Therapy from Washington University School of Medicine, Mallinckrodt Institute of Radiology. As a Medical Dosimetrist, Susan works as a team with the physician and physicists to create plans for treatment delivery. Susan is married, and has two children and one grandson. In her spare time, she enjoys spending time with her family, sporting events, concerts, and traveling.